Ever tried to sneak into a kid’s birthday, school show or library show with a rabbit, only to be caught by every kid in the room? The Incognito Professional Rabbit Carrier will make that challenge disappear! Give your bunny and yourself the VIP treatment you both deserve. As the co-star in your show, your rabbit needs comfortable, safe and humane transport between performances – and a special carrier to keep his magical appearance a surprise! This clever rabbit carrier is constructed from the same sturdy 1/2" and 3/4" birch furniture grade plywood as our partner, Showtime Magic Products, uses to create their other well-known products. Then it’s covered in charcoal gray, durable, long-wearing, poly-fiber upholstery which will provide years of service. 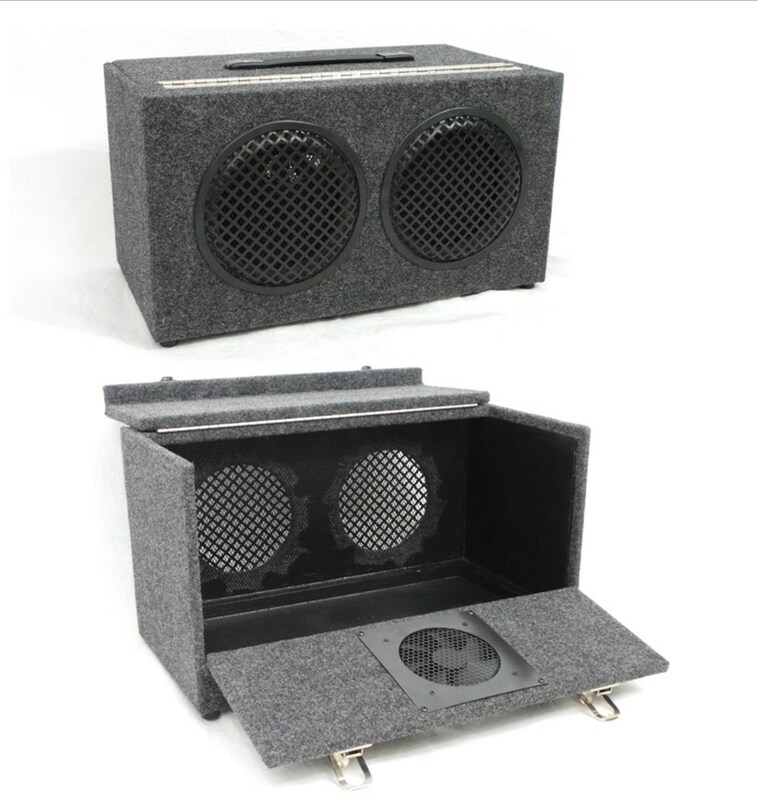 This looks so good you'll want to show it off to your magician buddies -- and they’ll be surprised to learn that the two giant 8-inch speakers are really front air vents in disguise! 1. Include a USB-powered vent fan provides a constant and comfortable airflow to keep your bunny cool. It may be plugged into any standard mobile phone USB power source including wall outlet chargers, auto chargers, or portable battery pack (power source not included). 2. Get the removable aluminum floor grate to ease cleaning the carrier. Front interior wall is lined with fine mesh to further conceal the rabbit and prevent it from chewing on vent openings. Rubberized interior floor and gloss black interior sidewalls for easy cleaning. Exterior dimensions approx. 11" x 11" x 22"
If you own the Showtime Magic Products Large Pro Suitcase Table, it fits perfectly into the upper shelf area or lower shelf when the table is open. At AmazeKids and Vanishing Inc., we partner with magic manufactures that make only the best products. We know what you’re thinking. "Wow, this is expensive." We concur. But, if you are a working pro that features a live rabbit in your family show, you know the daily effort it takes to care properly for it. That’s why we hear, over and over again from magicians that own the Incognito Professional Rabbit Carrier, "It's totally worth it and a complete must-have product for any magician that works with a rabbit."